If you’ve ever gone antiquing, it’s likely you’ve rolled in to a location (usually outside of most towns) where there is more than one antique shop. While technically competitors, the nature of these shops being near one another makes it so that you can visit one place, and have opportunity to visit more than one antique shop. The shopper’s benefit, and as a result the sellers do too. This is the same premise for the recently launched Estate Pipes Central—the brain child of Mkelaw Pipe’s Dave Neeb. I spoke to him recently about the genesis of the site and what they’re looking to do. 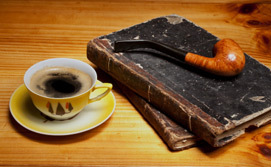 Now, Estate Pipes Central could be a conglomerate of every person and company selling estate pipes that could be found. But this was not the intention for Dave. The very point was to gather well-known, reputable online retailers to one convenient location. Things have since progressed rather quickly, each member has sought to promote the site separately on whatever email lists or other forms of communication they have with their customers, and things have grown. Before the creation of Estate Pipes Central a few of the guys knew each other better than others. Dave Wolff and Dave Neeb have been friends for ten years, and Wolff even helped build Neeb’s website. Then Mike Gluker and Marty Pulvers knew each other, one pulled in another and finally Dave Neeb reached out to Scott Townsend. "Nobody needed a lot of convincing," Dave said, "And there are no real roles, we just sort of do things by consensus, everything has been informal governance wise." But the standards are kept high, he pointed out, no one is selling any junk, typically what you’ll find on any of these sites are quality pipes. I then dug a bit in to Dave’s history. He wove a story for me while puffing away on a sandblast pipe built to be like Dunhill’s Cherrywood shape with a bamboo shank—one he’d made himself. And that was part of where he got started, restoring pipes and making your own. When he makes a pipe that has some kind of mistake or the briar doesn’t cooperate , he adds it to his own collection. And the process of restoring pipes helped him in learning the art and craft of making them. As for tobacco, Dave sticks pretty much entirely to a blend called Black Stoker from Uhle’s in Milwaukee. He was on a golf course a number of years back and his group was joined by a stranger who saw he was smoking his pipe and inquired about what blend Dave was enjoying at the time. Dave told him and he responded, "I’ve got something you’ll probably like better." Turns out the gentlemen was Jack Uhle himself—and Black Stoker has been the default since. Then our conversation turned to getting into estate pipes. "About 18 years ago," Dave continued, "I had a bunch of pipes I wasn’t smoking, so I decided to try this e-Bay thing. I became a member in 1999, but before I sold anything, first I had to buffer and clean my own my pipes." Then he started buying up groups of pipes from estate sales and reading up online about how to restore old pipes. "I did e-Bay for about 5 years, but I got tired of being on e-Bay’s schedule." I pressed on this point and he mentioned that there is a practical matter that if you want a pipe to sell for as much as possible the auction needs to end on a Sunday, which means you have to list them on a Thursday, and you can’t go very long without having new things listed or people will forget about you. It becomes a constant churn with a specific schedule. There’s also the e-Bay fee (a percentage of the sale). Which drove him to set out on his own. Here we are years later, Dave has built a reputation for himself and he’s still buying up and restoring old pipes. Now, together with these few other guys, they’ve built a place where estate buyers can go and peruse several sites looking for the right pipe that speaks to them. If you’re a fan of estate pipes, you can buy them from a handful of places, but be sure to swing by and check out the fraternity that has sprung from the fine gentlemen at Estate Pipes Central. Looks like a great idea. I have done business with Briar Blues, and was pleased with my purchase. Glad to have a central source for other high-quality estate pipe folks.